Full text of the intervention made by Joan Brady, the International Coordination Committee member of La Via Campesina, during the closing session of the VI Global Conference on Family Farming, March 2019, Derio. Thank you for the opportunity to reflect on the past few days of forum and the upcoming Decade of the Family Farming on behalf of La Via Campesina (LVC). I am taking the part of General Coordinator Elizabeth Mpofu who is unable to attend due to the recent passing of her husband. I am a member of the LVC International Coordinating Committee and am Regional Coordinator for North America. I farm with my family in Canada. We, as La Via Campesina are an international movement bringing together millions of peasants, small and medium size farmers, landless people, rural women and youth, indigenous people, migrants and agricultural workers from around the world. We are more than 200 million peasants in 182 organizations in 80 countries. LVC is glad to be a member of the Steering Committee of the Decade, along side the World Farmers’ Organization and World Rural Forum. I and the other LVC members in attendance have enjoyed being with you at this event and thank WRF for organizing it and on the work done to ensure that the decade will go forward. I recall participating in the International Year of the Family Farm. On behalf of LVC, I made an intervention challenging the definition used to define the family farm – a purely economic one which only recognized the labour of the family as criteria. Family farm also has social and environmental value as they are community members and stewards of the land and I reminded the assembly of the importance of the involvement and consideration of women and youth in food production. Together in this Decade of Family Farming, we have the opportunity to first address the structural causes of the disadvantages faced by women and youth in access to land, water and other natural resources. And secondly, The Decade should also be an opportunity to analyse why youth are obliged to migrate to urban areas rather than staying in agriculture and rural areas. Once again, I would like to share LVC’s viewpoint on the importance of how we define the decade. We feel strongly that the focus of the decade must go beyond Family Farming and must include other family producers such as pastoralists, fisherfolk and indigenous peoples. We also feel the identity and role of the peasant has been overlooked and that peasant and small holder agriculture must be the centre of any activity in the Decade. Through peasant agriculture, we will cool the planet and feed the world. LVC works within the framework of Food Sovereignty. Food Sovereignty clearly defines an alternative to the current industrialized food system and centers food producers and communities as the decision makers. It develops a model of small-scale sustainable production benefiting communities and their environment. Food Sovereignty ensures that the rights to use and manage lands, territories, water, seeds, livestock and biodiversity are in the hands of those who produce food and not of the corporate sector. The peasants of LVC are activating Food Sovereignty through the development and refinement of agroecology. Agroecology is not only a farming system but a life style which does not harm the landscape, allows peasant autonomy and is independent of chemical inputs and genetically modified seeds. It works with and respects nature, seeds and the land. It is also a human practice as peasants work together to both build the solutions, techniques and understanding, as well as spread the knowledge through peasant to peasant exchange. Through agroecology, we are continuously innovating to solve the challenges we face on daily basis with climate crises. We, as peasants and family farmers should be recognized and supported as key political actors of our own innovation, change and development, rather than beneficiaries of technical solutions. Food Sovereignty also puts the achievement of women’ rights at its centre. We need to change the narrative on the empowerment of rural women where we are very often shown as victims in need of anti-poverty policies and social assistance and treated as objects. We, peasants and women farmers are active political subjects, agents of our own change and development, and we must be recognized as having the right to self-determine ourselves and our bodies. We require public policies that are gender-oriented or specific for rural women, with adequate budgets to guarantee their effective implementation. What we need are instruments and actions to promote gender equality directed to women’s organizations, promoting self-empowerment, self-training and women’s autonomy. On behalf of LVC, I want to offer a caution about the involvement of the private sector as has been advocated at this forum. We, the millions of peasants, small and medium size farmers, landless people, rural women and youth, indigenous people, migrants and agricultural workers have been brought together to create a response to the actions of the private sector. We have created Food Sovereignty as a reaction to the powers of transnational companies as well as the proprietary interests in trade agreements. We have experienced first hand these actor’s extractive exploits as we have lost land, the right to our own seeds, water, the rewards of our labour and in extreme cases our lives. Food Sovereignty and agroecology will ensure that we meet the Sustainable Development Goals and more importantly will create an agriculture that will stop the ravishes of climate change, create sustainable communities and feed the world. Myself and other LVC members were glad to participate in the various working sessions and exchanges during this conference. I am energized and hopeful as a result of the discussions and viewpoints shared by other family producers. It reinforced my belief that we as farmers, fishers, peasants, indigenous peoples, youth and women have the answers to the challenges that face us! We have already gathered together in producer organizations to further our actions and our voice. LVC feels it is critical that the decade is led by producers, that the solutions are at the community level, the level where family producers, in an organized way can act and really be the actors of change. That is where the investment needs to be. I joined a farm organization and became involved in the leadership for a very specific reason. I very much wanted to fix a problem. I looked for a farmer organization with the correct analysis, corresponding policy and a mechanism to advocate for the proposed solution. We all joined producer organizations for a similar reason, our desire to change a situation and work with others in developing a solution. 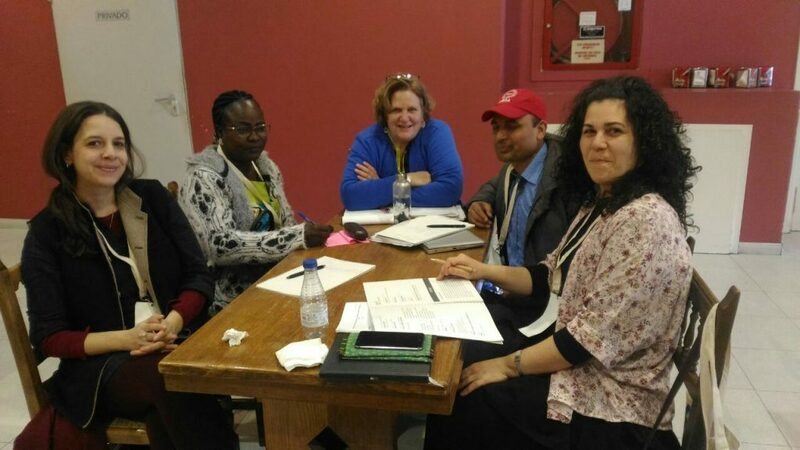 It was interesting to me that in each discussion during the first day of producer organization exchange and again during the women’s working session – policy and advocacy were identified as elements most needed to kickstart any action. Once again emphasizing a need for strong producer organizations to serve as the voice and focal point of producer action. To LVC it is critical that during the decade, the voice of producers is heard, amplified and successful in leading change. In order to achieve that, the Decade should be led by family farmers’ needs and not by institutional priorities. Our producer organizations is also where we need to begin to implement the transversal pillars of supporting youth and promoting gender equity, including both youth and women in leadership and activities. It is also the policy lens that is the key to implementation and changing attitudes and traditions. Within LVC we are intentional in our delegations and leadership structures to give women and youth equal opportunities and voice. We as a movement, have benefited from the energy and perspective that women and youth provide. Finally, I want to remind you of the asset LVC brings to this decade of the family farmer! On December 17 2018, the 73rd Session of the United Nations General Assembly (UNGA 73) in New York adopted the UN Declaration on the Rights of Peasants and Other People Working in Rural Areas. These rights include the right to life, and adequate standards of living, the right to land and territory, to seeds, information, justice and equality between men and women. The Peasants’ Rights Declaration also includes some of the issues that we still need to address and discuss during the Decade such as the rights of agricultural and migrant workers, sharecroppers, landless farmers. Now that the declaration is an international legal instrument, La Via Campesina (LVC) and its allies will mobilise to support regional and national implementation processes. With 121 member states of 193 votes in favour, there is an additional indication of the potential support and commitment to the success of the decade. We would like to see all of you joining this effort to implement our rights as peasants and workers in rural areas in the framework of the Decade of Family Farming. Thank you for this opportunity to share the LVC perspective. We look forward to impacting and participating in the goals and planned actions of the Decade of FF and walking beside producer organizations, our allies and institutional supporters.